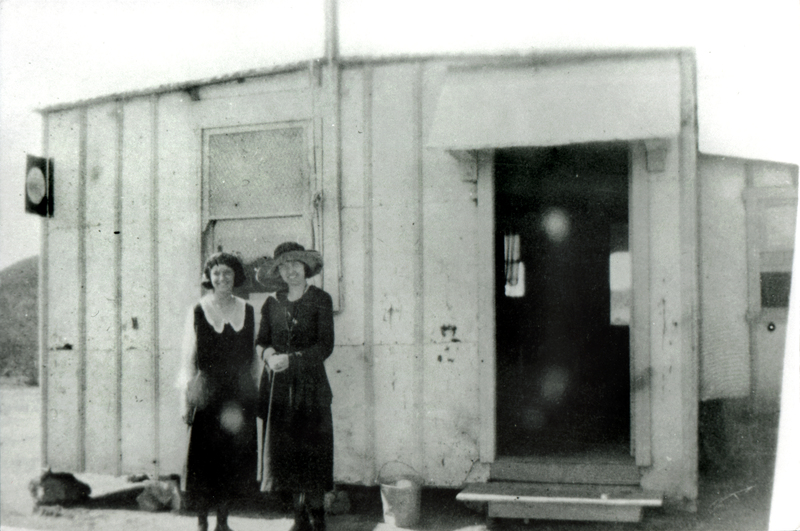 Miss Pansy Barrington, left, and Miss Clara Long (teacher) in front of the first Agua Dulce School, 1916. Identification by Meryl Adams (1988:201). Clara Long married Glen Wright to become Clara Wright; in 1926 they had a son, Chuck Wright, who became a surveyor and remained a lifelong Santa Clarita Valley resident. The first Agua Dulce School opened in 1914 in upper Mint Canyon at what is now 34709 Agua Dulce Canyon Road, on land donated for that purpose by the Ulysses Sumner Grant Johnson family. Mr. Johnson, known as "Dad," arrived in that year from Sawtelle, along with his wife Lula and their eight children. They homesteaded 160 acres at the junction of Agua Dulce Canyon Road and Mint Canyon Road (now called Sierra Highway) and wondered what to do about school, since the nearest school was the Soledad School in Acton, nine miles away (Meryl Adams 1988:201). So they donated a piece of their property and the whole community pitched in to erect a 16x16-foot board-and-batt structure. "(I)t was for the people, children and adults," Adams writes. "In addition to school, dances were held there on Saturday nights. Sunday school, suppers, church services and community meetings began to use the new school within a few years." The first four teachers were Miss Lucile Benson, Mrs. Lillian White Stratton, Miss Eleanor Griffin and Miss Clara Long. The latter "became Mrs. Glen Wright during her time of teaching at the Agua Dulce School," Adams writes (ibid.). In 1926 the original building was replaced on location by a more modern structure, which remained in use as a school until 1948. Afterward it was converted into a church. AP1935: 19200 dpi jpeg from copy print. (Apparently a photograph of a photograph.) Same as AP1804.